Dan Hartman always seems to be trying to learn new things. 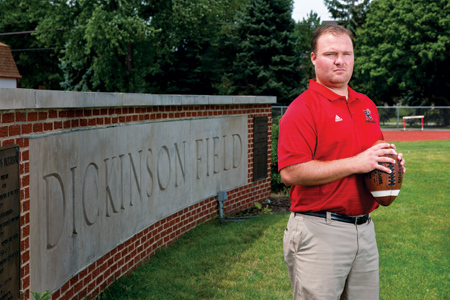 About the same time that he was named Hinsdale Central’s new head varsity football coach in May, the 30-year-old was finishing up his second master’s degree. He also has flown across the country to meet with college coaches about their offenses. And, most recently, Dan spent the summer doing his homework on Hinsdale Central’s program, getting input from a variety of sources: graduated players, former Red Devils football coach Ken Schreiner, and parents of lower-level players. “I think they’ll find out I’m pretty driven,” says the coach. “The toughest thing is just getting to know everyone [players, coaches, administration, youth program, and football club] > involved in the program in a condensed amount of time. “I’m trying to learn about the things that need to be changed to make the program just a little more successful,” Dan says. That quality has helped him achieve success not only on the field, but also in the classroom. During his three seasons at Evergreen Park, he had a combined 27-9 record and three state playoff berths. Prior to his arrival, Evergreen Park was struggling, sporting an 18-37 record over the previous six seasons. Dan also was named the school’s Educator of the Year in 2012-13. Under Dan, Evergreen Park finished 10-1 last fall and claimed its first undefeated South Suburban Red conference title before a second-round upset playoff loss. He led his 2012 team to a 9-4 finish and a run to the Class 4A state semifinals as a No. 7 seed. His 2011 squad went 8-4 and reached the state quarterfinals as a No. 13 seed. Dan replaced Rich Tarka at Hinsdale Central. Rich was dismissed in March after three playoff seasons, including an injury-marred 5-5 finish last fall. Dan Hartman played wide receiver at Division III Thomas More College. He then had assistant coaching jobs at Cascade and Crown Point high schools in Indiana before landing at Evergreen Park, where he also called the offense. What also helped Hartman on the offensive side were his trips to West Virginia and Oregon the last two years to meet with those college staffs about their spread attacks—schemes similar to the one he uses. “My philosophy on offense and defense is that you always want to be something a little bit different than what your opponent will see on a weekly basis. That might give you just little bit of an advantage,” he says.